Are you in the mood for FALL??? get you in the spirit! 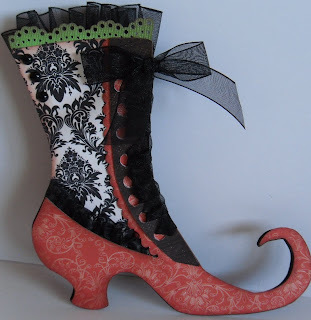 What Witch wouldn’t just Love these Fabulous Shoes from Theresa Kelly! 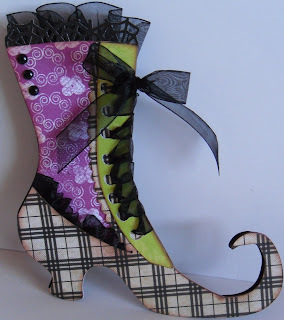 With Halloween coming I thought it would be fun to make some Cards and what Witch, oops, I mean Girl doesn’t love shoes???? And what do Witch’s and shoes have in common you ask?? 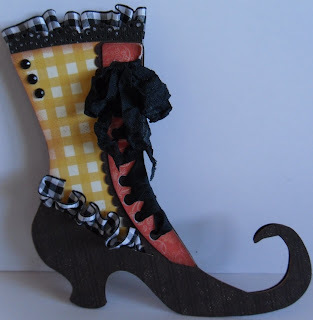 Well this Witch made a few Witch Shoe Cards!! I used my Cricut to make these using the Happy Hauntings Cartridge. I used all kinds of papers on these. They are all Quick Quotes papers with the exception of the card-stock which is Colorbok. I used Cherry Truffle, French Quarter, Miss Morgan, Savvy Davvy, and some of the May Cosmo Cricket leftover papers. I inked everything with the Yummy Quick Quotes Powder Puff Chalk Inks, Mocha Mama and Midnight Confessions. The extras I used are the ribbons, Black Crinkle ribbon, Sheer Black and Black Gingham, a couple of Martha Stewart punches and a bit of bling, that’s it very minimal! I just wanted to highlight the versatility of all the Quick Quotes papers and how you can mix and match them and make them your own! October is a beautiful month. I love the changing of color and the cooler breeze! That is why I think these month’s kit is my favorite of all ( well, until the next month comes along =)) . I used the DP280 Fall-TC kit!! Beautiful kit, I am able to create this 2-page layout and a card (coming next week), and there’s so much more left over!! Other supplies I used are Creative Imagination stickers, Making Memories Bat; Bo-Bunny Stamp, Martha Stewart Punch. Thank you for looking and visiting QQ blog. Theresa love everyone of the witch shoes. They are so cute. Adora your layout is beautiful. Thanks ladies for great ideas. 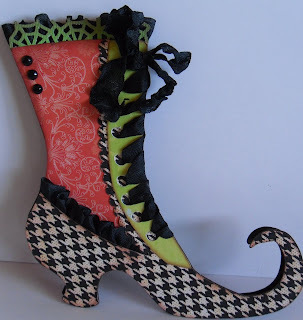 What great ideas..the shoes are FABULOUS!! (and I don't care much for Halloween!). Adora your layout is beautiful, I really like the chandelier you added. Thanks for the inspiration ladies!